Obama, First Lady Dance to "Let's Stay Together"
President Barack Obama kisses first lady Michelle Obama during their dance at the Commander-in-Chief Inaugural Ball. With the more rigid formalities of Inauguration Day behind him, President Barack Obama took to the dance floor Monday night to share his first dance of his second term with the woman he said he was "lucky to have." Wearing a white bow tie, a small American flag pin on his lapel, and a giant grin, President Obama spoke glowingly about his wife before introducing her at the Commander-In-Chief Ball—the first of two official balls the couple would attend for the night. "She inspires me every day. She makes me a better man and a better president," Obama said to service members and their families in attendance. "The fact that she is so devoted to taking care of our troops and our military families is just one more sign of her extraordinary love and grace and strength. I'm just lucky to have her." And then there she was. Michelle Obama made her grand entrance in a custom Jason Wu ruby red chiffon and velvet gown. She grabbed his hand and the two headed for the dance floor to the sound of cheers. Jennifer Hudson, in a long black gown, provided the soulful music—Al Green's "Let's Stay Together." The first couple sang to each other, Michelle Obama snapped her fingers and the president leaned in and playfully smirked at his wife. And they shared a kiss before breaking off to dance with some of the luckiest guests in the room. 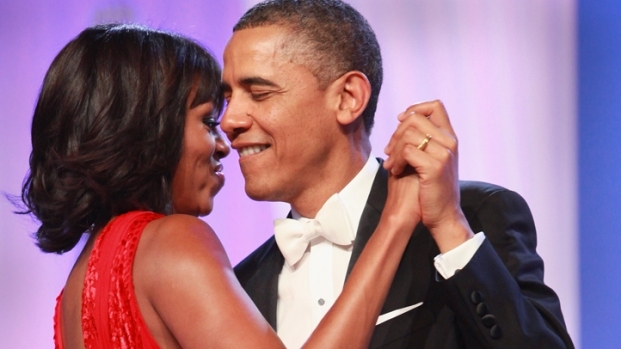 After the dance, Michelle Obama took to her new Twitter account and documented the moment: "Just danced to "Let's Stay Together" with the love of my life and the President of the United States. I’m so proud of Barack. –mo."